Memorial Day is in the rearview mirror, the school year is winding down and the air has turned heavy and warm…summer has arrived in Saint Paul! It’s time to assemble your summer reading list, hit the pool/beach/lake/air-conditioned living room, and start reading! I plan on doing a lot of reading this summer so I thought it might be fun to start an Irish American Book Club here on the blog. I’ve never been much for the traditional book club. I like to discuss books as I am reading them. It’s hard for me to save up all my key points and insights for the monthly club meeting. I also don’t like the pressure involved in the typical book club – I don’t like people telling me what book to read and when to read it. This will be a different kind of book club. I am not exactly sure how it will take shape, but for starters, I would like to hear what Irish American books have been on your radar lately. I need some suggestions as to what I should read this summer and I would like to hear what people think about what they’re reading. Books should be by an Irish-American author or have a subject involving the Irish in America, but needn’t be both. Readers will share what they are reading and will be honest with their critiques and praise. We will have fun reading! I also thought about Colm Toibin’s Brooklyn, a book I loved. The movie was great as well, but the book was better. However, I put all of this out of my mind when I began reading Saints for All Occasions because I wanted to have an open mind. I didn’t want to compare it to a real-life situation or another novel. Has anyone else read Saints for All Occasions? I would love to hear what you thought of it. I think it is a perfect summertime “beach read.” It is just over 300 pages and it goes pretty quickly. Regan and I discussed it as we read, carefully monitoring where the other was in the story as to not spoil anything. Leave a comment and let us know what you thought! If you have book ideas or thoughts on Saints for All Occasions, tweet me @ainemccormack1…I’d love to hear from you! Categories: Book Club, Irish American | Tags: Boston, Brooklyn, Colm Toibin, Irish-American authors, J. Courtney Sullivan, Maureen, reading, summertime | Permalink. I love this photo of three young Irish American men, taken in the early 1940s. 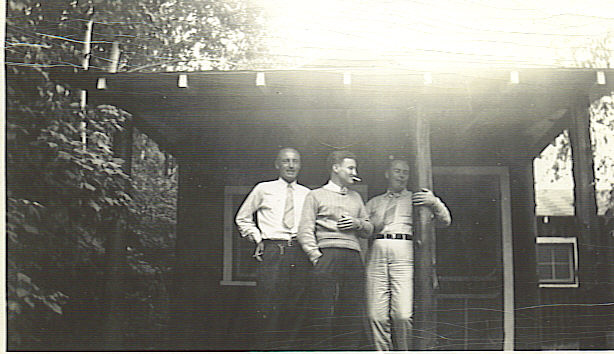 From left to right: my grandpa Bill McCormack, his brother-in-law Jimmy Flannery, and his brother Jim McCormack. Categories: Irish American Faves | Tags: chat, Flannery, laugh, McCormack, porch, summertime, young | Permalink.